Skeletal and systemic manifestations lead to worsening physical impairment in a man with hypophosphatasia. 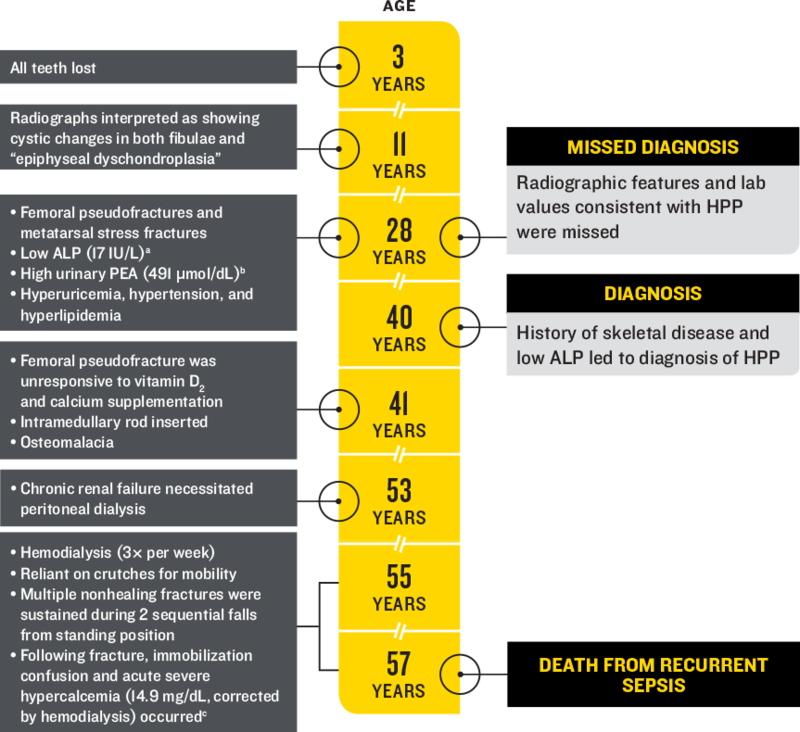 Chronic, progressive, systemic consequences of hypophosphatasia can result in acute catastrophic events that increase risk of mortality throughout life. Based on a published case study: Whyte et al, J Clin Endocrinol Metab, 2013.
aNormal ALP reference interval used by the laboratory in this case study was 28-88 IU/L. Please note that reference intervals can vary among laboratories. bNormal PEA reference interval used by the laboratory in this case study was 26-101 μmol/dL. Please note that reference intervals can vary among laboratories. cNormal serum calcium reference interval used by the laboratory in this case study was 8.6-10.3 mg/dL. Please note that reference intervals can vary among laboratories.